This August, don’t pass up the chance to come on out to Southeast Louisiana’s premiere fall event. The upcoming Pontchartrain Home Show is just weeks away, and no one who’s interested in interior design, furniture, architecture or contracting will want to miss showcase of the latest in kitchens, bathrooms, doors, siding, solar products, and much more. 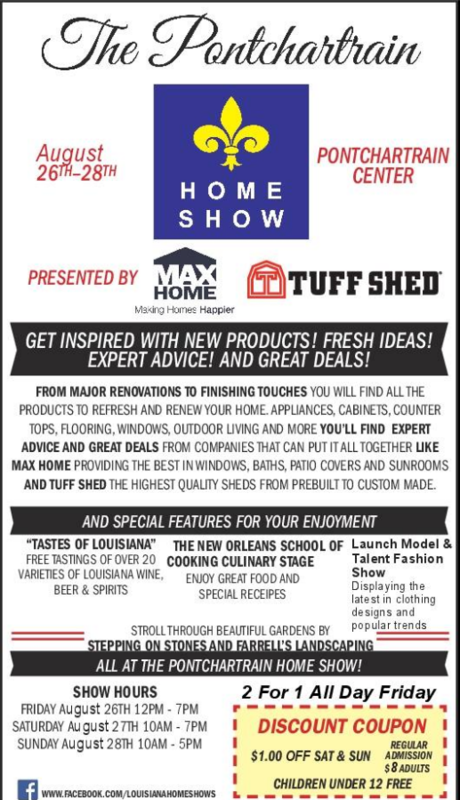 The Pontchartrain Home Show is Right around the Corner! You need to make plans now to get out to the biggest and best home event in the state, before it is too late. Of course, the show is primarily geared toward home products, décor, and demos. But, it is not just about homes. Over the event’s history, spanning more than 2 decades, this event has grown and expanded to include products for healthcare, jewelry, fitness and more. There will also be amazing specialty foods and personal well-being products to explore. With over 35 years of experience, JAAS is the “the name” in home shows. Events produced by JAAS Productions are filled with quality exhibitors, exciting features, giveaways, and more. The company is creative in the way that they think about the home industry and their passion for amazing trade shows shines through at all of their events. The Pontchartrain Home Show is just another example of what these hosts can do! Have you ever been to a home show? If not, you are in for a treat. If you have been, but not to one put on by JAAS, then you will likely be impressed by the degree of excellence and amazing event organization that they offer. Fantastic products for your home, and more. This event is family friendly with children under 12 getting in free. The cost for an adult is only $10. You can’t miss our collection of traditional French doors, wrought iron doors, beveled glass doors, and carved solid wood doors that Doors of Elegance will be able to share with you at the event. They are built by expert craftsmen and are more than just the same old doors. They are full of character and creativity, and showcase the company’s specialization for beautiful, elegant and durable doors. Doors of Elegance will be located at Booth 700/702 and our amazing staff will be there ready to answer any questions and discuss any concerns. Whether you are moving into a new place, remodeling, building from the ground up… or just want a new door… a custom door from Doors of Elegance will become a showpiece in your home. Contact us for more information about the show, or to chat with customer service about your needs.